I have always wanted to learn to make custom animations for Sims 1, and I finally did! Click on the object image to download. Be sure to read the description for awesome and important info! Can you believe that this kawaii kitty/bunny dance is actually Swedish instead of Japanese? 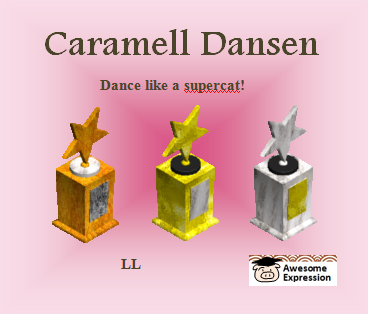 Unleash the star power of the Caramell Dansen on your bored Sim friends and rouse them to dancin'! Keep on dancin' to confirm that you are charmin'! With the Caramell Dansen, there shall be no booin'! *The object may work if you simply place all files in the same (sub)folder under Downloads. If not, place the iff file under Downloads and the bmp, .cmx, and .cfp files in the GameData > Skins folder. Group activity: The Sim will put on cat's ears and tail to perform. No booing! 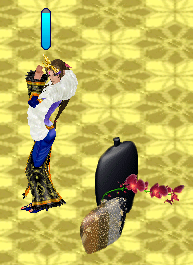 Base: Maxis electric guitar, cat's ears and tail from Amulet. Animation sequence based on Swedish (!) cartoon song Caramell Dansen. Update Feb 1, 2015 - updated object iff with GUID to avoid ID crash. Please replace the iff. Do you know that kabuki - classical Japanese dance drama - was founded by female but then transformed into all-male cast? With our Kabuki Dance, however, you can perform on the glamorous stage whether you are a 200-pound girl or a 80-year old man and attract a crowd. Audience approval guaranteed! And there's more! A lush faux fur is included as prop to enhance your star power! Order now and become a Japanese dancing star today! * Place the iff file under Downloads and the bmp, .cmx, and .cfp files in the GameData > Skins folder. The object may still work if you place all files in the same (sub)folder under Downloads. Group activity: The Sim will put on a lush fur to perform. No booing! Base: Maxis electric guitar, fur from Romisch at http://romisch.boy.jp/main.htm. Animation sequence based on kabuki performance by Bando Tamasaburo.